One holiday tradition for our family is to celebrate Christmas at Disney parks. In particular, we usually visit Walt Disney World for Christmas because it is close to our home of Atlanta, Georgia. However, Christmas and holiday celebrations take place at Disneyland in California as well as other Disney Parks around the world! So wherever you are located, you can experience the magic of Disney during the Christmas holiday season. Cinderella’s Castle is covered with thousands of lights that change color – to look like sparkling ice! The Magic Kingdom park is the epitome of wonder and delight, especially during the holiday season. Garland and tinsel are hung across Main Street, and light up with a warm glow at night. Also, the holiday music on Main Street is accompanied with actual snow falling from the sky. Imagine, snow in Florida. Now everyone can have a white Christmas. Throughout the Magic Kingdom park you will find ample holiday décor. Some of the attractions will even have special decorations or themes just for the holidays, such as the “Jingle Cruise” (normally, the Jungle Cruise). 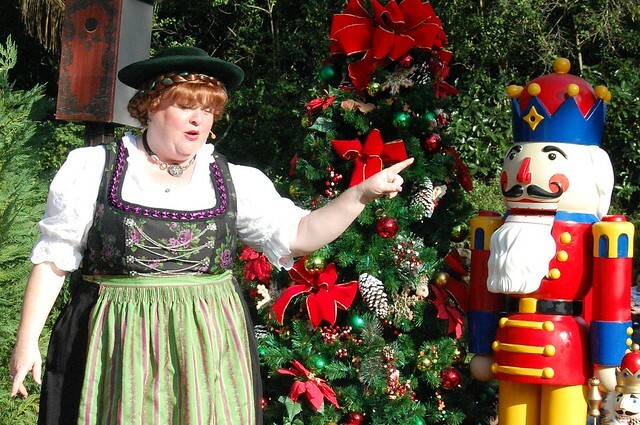 The characters are dressed in their holiday finest, special shows are held throughout the park, and the Christmas Parade is more than enough to get you in the spirit of the season – especially with the army of life-size toy soldiers who march in unison with a hypnotic sound. Lastly, look into attending Mickey’s Very Merry Christmas Party. This special separate ticketed event at the Magic Kingdom is an awesome way to experience the holidays in the park, with less crowds because they limit the number of tickets sold. Beginning in the evening (after the park closes to day guests), you will have a blast enjoying special Christmas shows, and incredible fireworks display, special parades, and indulging on free holiday cookies and hot chocolate all over the park. It’s definitely a magical holiday experience! While I really love the Magic Kingdom during the holiday season, my second favorite would have to be Epcot. Epcot is one of my favorite parks because of the World Showcase, where they have pavilions that highlight different countries and cultures from around the world. As a traveler, I love that it feels like I’m taking a trip around the world every time I go to Epcot. During the holiday season, the World Showcase is presents “Holidays Around the World” where you can experience the different holiday décor, food, and stories from many different countries. We love learning about the different traditions and songs that are sang in different languages. 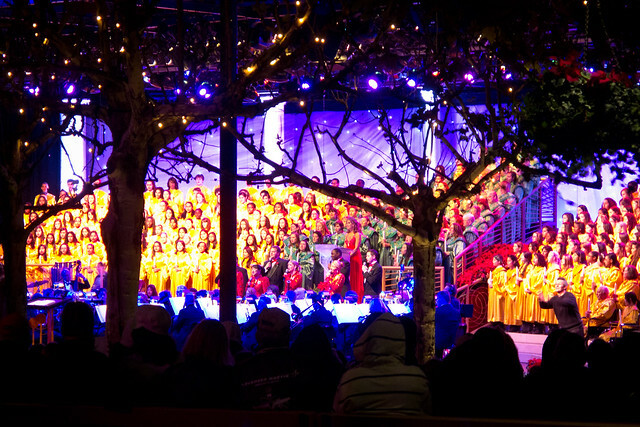 Epcot is also home to one of the best shows of the holidays, the Candlelight Processional. This popular show includes a 50 piece orchestra and an enormous choir that accompanies a celebrity host who reads the story of Christmas. After each verse, there is a song. The show is absolutely beautiful with the lighting and costumes, and will touch the hearts of everyone, regardless of their personal religion. There are 2-3 shows a night, and the line will be very long to get a seat. So you must get there early, otherwise, you can stand and watch in the back. Finally after the last Candlelight Processional show, there are the most glorious of holiday fireworks that you will ever see. The regular Epcot IllumiNations show (also one of my favorites) is extended with a special holiday presentation. During this last part of the show, it seems like they shoot off more fireworks than the entire show preceding it. It’s packed with firecrackers and spirit as the music shouts “Peace on Earth” with enough energy to bring a tear to your eye. We really love how the show emphasizes the world coming together, regardless of culture, language, or religion and focuses on the message of peace. Disney’s Hollywood Studios is also decked out for the holiday season. This is the place to visit to see one of the biggest light displays in the world; the Osborne Family Spectacle of Dancing Lights! Each night around 6pm, the lights are turned on during a special ceremony. Located at the back of the park on the “Streets of America,” the area will be filled with people lining the streets enjoying the festivities. Osborne Family Spectacle of Dancing Lights at Disney’s Hollywood Studios is one of the best light shows you will see during the Christmas holiday! The Osborne Lights are a tradition for many families and have been at the Hollywood Studios since 1995. They actually began with the Osborne family in Arkansas. Each Jenning Osborne and his family they added to their elaborate holiday display and it became so big, that they now share it with Disney at their park! The spirit of the season fills you while holiday music plays in the background loudly and snow falls from overhead (yes, snow!). People stand in the streets eating holiday treats, drinking hot chocolate, and singing and dancing to holiday music, and laughing together. Experiencing the Osborne Lights at Disney’s Hollywood Studios is definitely something you shouldn’t miss. Enjoying the Osborne Lights for Christmas at Disney – snow falling from the sky and Christmas music! The Osborne Family Lights ended their run during 2015. Hopefully, the park will add some other holiday fun back…because this was one of our favorites. 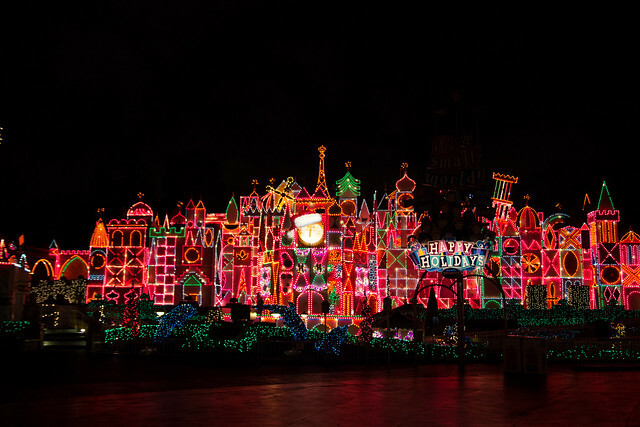 Just like the Magic Kingdom at Walt Disney World in Florida, Disneyland in California is transformed each year into a holiday wonderland for the Christmas season. Garland and tinsel are strung about, and lights sparkling on just about everything! Check out the Main Street Carolers as they roam the streets in traditional Victorian dress singing beautiful carols that echo in the streets. And don’t miss Sleeping Beauty’s castle all lit up, as well as their amazing fireworks show. As for the California Adventure park, beyond the décor you will find that the evening water show has been transformed for the holidays to “World of Color – Winter Dreams.” This awe-inspiring water, music, and color show is themed for the season with special segments for Snow, Enchantment, Glow, Spirit, Frozen, and Merry & Bright. If you are in Europe, then be sure to check out Disney’s Enchanted Christmas at Disneyland in Paris. The festivities run from November through the first week of January, and include special parades, shows, and lots of holiday décor! Click on the links below to check out special holiday festivities taking place at other Disney theme parks around the world!